valeri20	 03-08-2018 04-02-2018 Success 25 1/1 Sent 2016 Panini Prizm NASCAR Hall of Fame card and received back signed in black sharpie. Thank you, Mr. Jarrett! RobHarrington	 02-19-2018 03-04-2018 Success 13 2/2 Signed two cards in black Sharpie. 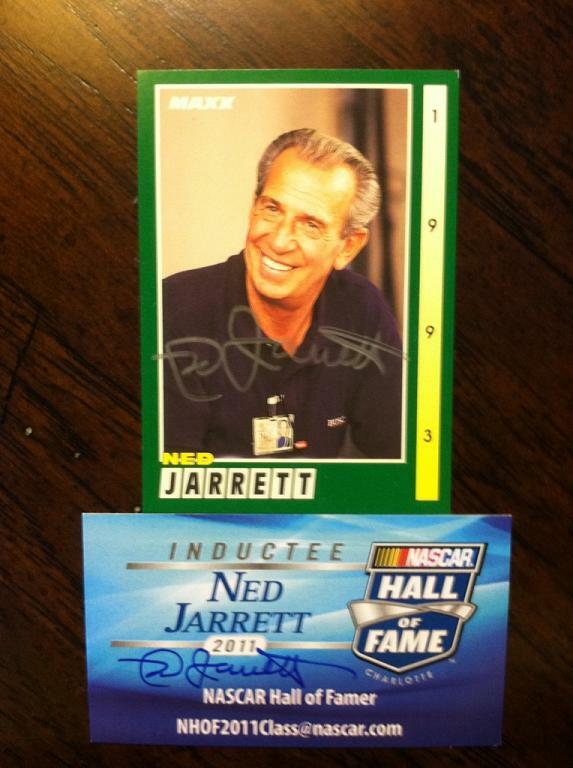 SyxxSynse	 12-19-2017 01-01-2018 Success 13 2/2 Signed my 2000 Upper Deck MVP Dale Jarrett card and my 2016 Panini Certified Immortals card. Thanks, Mr. Jarrett! elliottfan18	 07-07-2016 07-18-2016 Success 11 3/4 90 & 91 Maxx cards. Also sent extra card and signed my letter. Thanks Mr Jarrett! dunkanarchy	 06-03-2016 06-20-2016 Success 17 2/2 Signed both cards I sent. Thank yo Mr. Jarrett! Royals1982	 01-18-2016 02-26-2016 Success 39 2/2 signed 2 cards. SyxxSynse	 04-28-2015 05-08-2015 Success 10 1/1 1991 MAXX card. 10 days. Thanks, Mr. Jarrett! Thunderfoot	 12-15-2014 12-27-2014 Success 12 2/2 signed 99 UD, 10 Legends, 12 days, thanks Ned! Coltron57	 07-15-2014 07-26-2014 Success 11 2/4 2 4x6 photos. Signed both pictures and 2 IC in black. 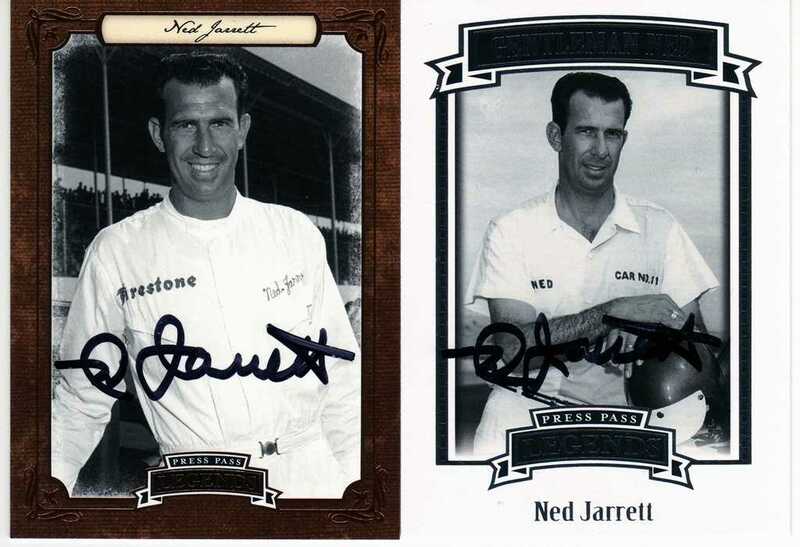 Thunderfoot	 11-25-2013 12-09-2013 Success 14 2/2 Signed 06 legends, and 09 legends, 14 days, Thanks Ned! LGBuffalo	 09-13-2013 09-20-2013 Success 7 1/1 Signed my card nicely. Thanks! cbtvideos	 07-19-2013 07-26-2013 Success 7 1/2 Sent one trading card, letter and SASE. Got back trading card I sent plus 1 extra, both signed with a black Sharpie. Sent back in SASE I sent. lizard-jd	 07-17-2013 07-27-2013 Success 10 2/2 Signed 2 CICs - TY! bcommerce	 04-03-2013 04-13-2013 Success 10 2/2 Sent 2 Cards!! Signed both!! No HOF Inscription! justinw182	 05-08-2012 05-19-2012 Success 11 1/2 Recieved my card back and signed in 11 Days! 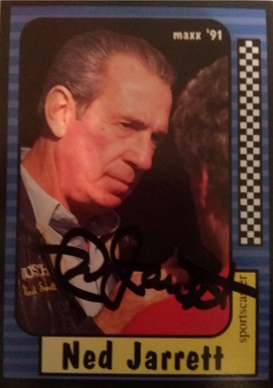 He also added anoother trading card, autographed as well. Pmurdick25	 09-08-2011 09-19-2011 Success 11 2/2 Signed the card but signed the pack filler on the wrong side. Very fast return! Jeremy_Falcons	 06-06-2011 06-12-2011 Success 6 1/2 He signed my trading card and added a signed NASCAR Hall of Fame card. Riggs	 11-12-2010 11-27-2010 Success 15 2/2 Great signer, FAST turnaround for a HOFer..